A YouTube video shows co-workers trying out an HP webcam with motion-tracking and facial recognition software. 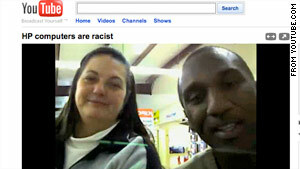 (CNN) -- Can Hewlett-Packard's motion-tracking webcams see black people? It's a question posed on a now-viral YouTube video and the company says it's looking into it. In the video, two co-workers take turns in front of the camera -- the webcam appears to follow Wanda Zamen as she sways in front of the screen and stays still as Desi Cryer moves about. HP acknowledged in a statement e-mailed to CNN that the cameras may have issues with contrast recognition in certain lighting situations. The webcams, built into HP's new computers, are supposed to keep people's faces and bodies in proportion and centered on the screen as they move. The video went viral over the weekend, garnering more than 400,000 YouTube page views and a slew of comments on Twitter. It was something neither Zamen nor Cryer expected to happen. Zamen said she and Cryer, her co-worker, were playing around with the computer at work and testing it when they stumbled upon the facial recognition feature. Cryer and Zamen said they were laughing when they realized the camera followed her and not him. "We thought it was pretty funny, we thought it was hilarious," Zamen said. So they made a video, which they planned to just share with friends on Facebook and YouTube. There was no script, no rehearsal, just two friends filming what they thought was a hilarious software glitch. So again, the two took turns in front of the camera. "As soon as my blackness enters the frame, it stopped," Cryer says in the video. "Black Desi gets in there, no face recognition anymore, buddy," he says. "I think my blackness is interfering with the computer's ability to follow me," he continues. But now that the video has gotten so much attention, the two co-workers want everyone, including HP, to know they never intended the video to spark a discussion about whether the webcam was racist. Zamen said she liked the computer so much, she suggested Cryer get one for his wife. "The intent was definitely not to go after HP, it just so happened the computer was an HP and we recognized the software glitch," Cryer said. "We did it for laughs, but if the video does make HP put out a better product, then great," Zamen added. HP was quick to react, too. The company quickly posted on the it's blog, TheNextBench.com, on Sunday after the video went viral, responding to concerns. "The technology we use is built on standard algorithms that measure the difference in intensity of contrast between the eyes and the upper cheek and nose," wrote Tony Welch, the lead social media strategist for HP's Personal Systems Group. "We believe that the camera might have difficulty 'seeing' contrast in conditions where there is insufficient foreground lighting." Meanwhile, Welch pointed users facing similar problems to HP's help page, which provides guidance on how to change the lighting or other optimization settings on the camera. On Monday HP also told CNN in a corporate statement that the issue is most likely related to lighting, but they are looking into the situation further. "HP has been informed of a potential issue with facial-tracking software. Consistent with other webcams, proper foreground lighting is required for the product to effectively track any person and their movements," the statement said. "As with all our products, we continue to explore refinements which help to optimize their use." Cryer and Zamen said they've heard similar feedback from commenters online offering ideas on fixing the lighting. The co-workers' video has also sparked others to try the product. After media coverage of the YouTube video, Consumer Reports did its own testing of the product to see if the YouTube video portrayal was accurate. In standard lighting, the webcam didn't move with an African-American male as it did with a white male. But after lighting sources were added, the webcam was able to track the African-American male's face and movements. CNN's Mythili Rao and Rachel Sherman contributed to this report.